Where Have All the Good Preachers Gone? Why is Vatican II So Vexing? Rome Reports has just published a video highlighting the organist of the Sistine Chapel Choir, Spaniard Juan Paradell-Solé. Narrator: But the Vatican also needs music, and since 2011 this Spanish organist plays in all the ceremonies that the Pope presides. It's the first time in history that the Sistine Chapel Choir, the Pope's private choir, has an official organist. He soon grasped that Pope emeritus Benedict XVI took very seriously the music in his ceremonies. Juan Paradell-Solé: He would chose or suggest the music he would like to be played or sung. And obviously, if he said he wanted that piece or some other one, we would play it. He increased the use of Gregorian chant and the use of multiple melodies in music. January 30th is the feast day of the Roman virgin and martyr St. Martina. The Martyrology notes the day of her death as January 1st, and that it took place in the reign of the Emperor Alexander Severus (222-235). Although far less well-known than her fellow Romans Agnes and Cecilia, by the 7th century there was a church built in her honor at the base of the Capitoline Hill, close to the Mamertine prison and the Julian Senate-house. In 1588, Pope Sixtus V gave it to a confraternity of artists named for St. Luke the Evangelist, and it has ever since been known as ‘San Luca e Martina’. Starting in 1634, a complete reconstruction of the church was guided by one of the great artists of the Italian Baroque, Pietro da Cortona, and brought to completion after his death in 1669 by his students. At the very beginning of the works to clear away the previous structure, the relics of St. Martina were rediscovered within the ruins; Pope Urban VIII then added her feast to the general calendar, giving her two proper hymns of his own composition. (With all due respect to both the Saint and the Pope, they may easily be counted among the worst Latin hymns ever written.) Since the acts of St. Martina are considered at best highly unreliable, her feast was removed from the general calendar in the reform of 1969, but remains on that of the Extraordinary Form. The confraternity of San Luca also keeps her feast day each year with a solemn Mass, this year celebrated (OF) by His Eminence Raymond Cardinal Burke, Prefect of the Apostolic Signatura. A reliquary of St. Martina, who was beheaded after the infliction of many torments, placed on the main altar of the church on the feast day. The counter-façade, with the dedicatory inscription and the crest of Cardinal Francesco Barberini, nephew of Urban VIII, who took great personal interest in Pietro da Cortona’s work, and was one of the principal sponsors of the rebuilding project. The funerary inscription of Pietro da Cortona, just in front of the main door. The church has a large crypt, the pavement of which is at roughly the same level as the original church. In the antechamber before the main chapel are the relics of four other Virgin Martyrs, Saints Euphemia, Sabina, Dorothea and Theodora. Each has her own statue, with the relics enclosed below in the small sarcophagus on the wall. The upper part of the lintel between the antechamber and the chapel. The relics of St. Martina are in the main altar of the crypt-chapel. The right side-chapel of the upper church is dedicated to another sainted painter, Lazarus the Monk, who was tortured by Theophilus, the last iconoclast Emperor in Byzantium, for writing icons. After the end of iconoclasm, he dedicated his skills to restoring holy images that had been defaced. Dr Clare Hornsby, Director of Benedictus, Britain's first Catholic Liberal Arts University, has given an interview to Zenit about the challenges facing this ambitious project. You can read the interview here. Prepare your cameras! Readers are invited to send their photos of Masses and public celebrations of the Divine Office on February 2nd. Please send your photos to photopost@newliturgicalmovement.org. Andrea Grillo Replies to Alcuin Reid's Review of "Beyond Pius V"
We recently published a review by Dr. Alcuin Reid, the author of The Organic Development of the Liturgy, and the organizer of last summer’s Sacra Liturgia conference, of Dr. Andrea Grillo’s Beyond Pius V. The latter has lately been republished in English by the Collegeville Liturgical Press, updated with a new chapter on the motu proprio Summorum Pontificum and the instruction Universae Ecclesiae. On his blog, Dr. Grillo has made the following critique of the review, here translated by myself. The title and the conclusion of the review which Alcuin Reid has dedicated to the American version of “Beyond Pius V” betrays an obvious lack of understanding of the principal questions dealt with in the book. It is truly surprising, not to say shameless, that Reid would pass off as the “conviction(s) of liturgists and prelates in Italy” the solemn decisions of the Second Vatican Council, which then took shape as the reformed rites. The fact that the solemn deliberations of an Ecumenical Council are thought of as private opinions, and matters open to discussion, says a great deal about the respect for reality and for tradition which these reactionary approaches promise the poor reader. In effect, it is clear that he wants to defend, at all costs, even at the cost of reason, the logic of the rite of Pius V, declaring that, if one must really be “beyond Pius V”, one must also agree to be “beyond Paul VI”. In this regard, (but not only in this regard,) I have been absolutely misunderstood. For me it is obvious that “beyond Pius V” means necessarily also beyond Paul VI, beyond John Paul II, and even, – if we really must admit it – beyond Benedict XVI. What strikes me is that Reid wants to set himself, and the tradition which he regards himself as belonging to, “only” beyond Paul VI. Inevitably, I have the following doubt. Will it not be that case that, in agreeing to apply the preposition “beyond” only to Paul VI, Reid means it not as “beyond”, (but) as “before”? (note 2) It is not perhaps his intention only to remain, forever, before Paul VI? As long he can guarantee himself this result, Reid shows himself ready to reconstruct history and the liturgy of the last century in a completely ideological manner, and without any respect for the truth. I believe I have already wasted too much time on these pointless ravings. 1. The Italian word “strumentale’, here translated as “specious”, can also mean “deceptive” or “exploitative”. In the latter sense, it is commonly used in Italian politics, to claim that someone is using something else for political gain; a certain cheapness is understood to underlie his actions. As a nice example of the richness of the Italian language, this behavior has its own verb, “strumentalizzare”; the claim that your opponent is “exploiting” the matter in this way is decidedly not a compliment. 2. A literal translation of these words would be meaningless in English. The title of Dr. Grillo’s book in Italian, “Oltre Pio V” means “Beyond Pius V”, and is so translated in the two English editions. “Beyond” can also be expressed in Italian by the words “al di là”, which also means “over there.” The parallel expression “al di qua” means “on this side” or “over here.” But “here” cannot be applied to a theoretical state of affairs in which the Church has moved “beyond” the rite of Paul VI, still in use in the vast majority of cases where the Roman Rite is celebrated. The context demands therefore that the word be translated as “before”. I wish this to be made clear lest it appear to the reader that Dr. Grillo has been completely unjust to Dr. Reid. The Saint John Bosco Latin Mass Community will be presenting the first annual “Da Mihi Animas Conference” Friday, January 31st through Sunday, February 2nd at St. Elizabeth Ann Seton Chuch, 10655 Haverstick Road, Carmel, IN. The weekend will begin Friday, 7 P.M., with the community’s first-ever Solemn High Mass, in celebration of the patron saint of the community, St. John Bosco. Fr. Gregory Pendergraft F.S.S.P., will offer Mass, with Fr. Roberto Cano F.S.S.P., and Fr. John Hollowell acting as Deacon and Subdeacon, respectively. The conference will continue the next morning, Saturday, 9 A.M., with Low Mass followed by brunch. (Confessions will be available before and after Mass.) Brunch will be followed by a series of talks: Fr. Pendergraft will speak on “The Sacred Liturgy - the Fitting Worship of God”, and Fr. Cano’s topic will be “The Eternal Priesthood of Christ and the Theology of Worship”. The weekend will culminate in a Sung Mass in celebration of the Feast of Purification Sunday, 3 P.M. The traditional Blessing and Procession of Candles will proceed the Mass. (Parishioners are encouraged to bring their own candles for blessing, but processional candles will be provided.) Byrd’s Mass for Three Voices will be sung by the ensemble Cantus Ecclesiae. Following mass there will be a potluck dinner. All events are free and open to the public. For more information, e-mail us at uvcarmel@gmail.com or check out the Community's website at uvcarmel.wordpress.com. 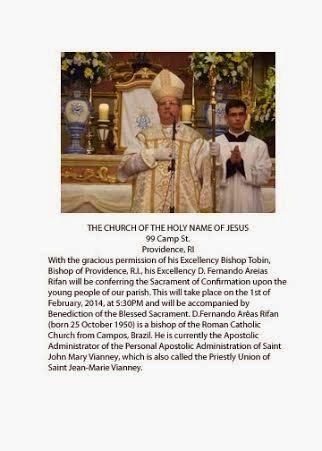 From Una Voce Rhode Island: With the gracious permission of His Excellency Thomas Tobin, Bishop of Providence, Rhode Island, His Excellency Bishop Fernando Arêas Rifan will confer the Sacrament of Confirmation on some of the young people of the parish of the Holy Name of Jesus, at 99 Camp St. in Providence. The ceremony will take place on Saturday, February 1st at 5:30, with Benediction of the Blessed Sacrament following. On Sunday, February 2nd, His Excellency will celebrate a Pontifical High Mass for the feast of Candlemass at Holy Name, for the regularly scheduled 11 a.m. Sunday TLM. Bishop Rifan is currently the Apostolic Administrator of the Personal Apostolic Administration of St. Jean-Marie Vianney, in Campos, Brazil. 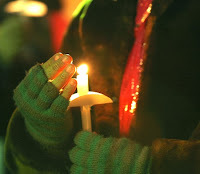 And keep the Candles in Candlemas! Our thanks to Ms. Sullivan for this write-up of the Benedict XVI Institute for Sacred Music and Divine Worship, newly founded in the diocese of San Francisco by His Grace Archbishop Salvatore Cordileone and Fr. Samuel Weber, O.S.B. If you are a lover of reverent Masses, this is the kind of news that could make your heart soar. Regina Magazine’s Secret Insider’s Guide for Priests issue (December, 2013), included an article with breaking news about a new liturgical institute that was about to be launched in the archdiocese of San Francisco. 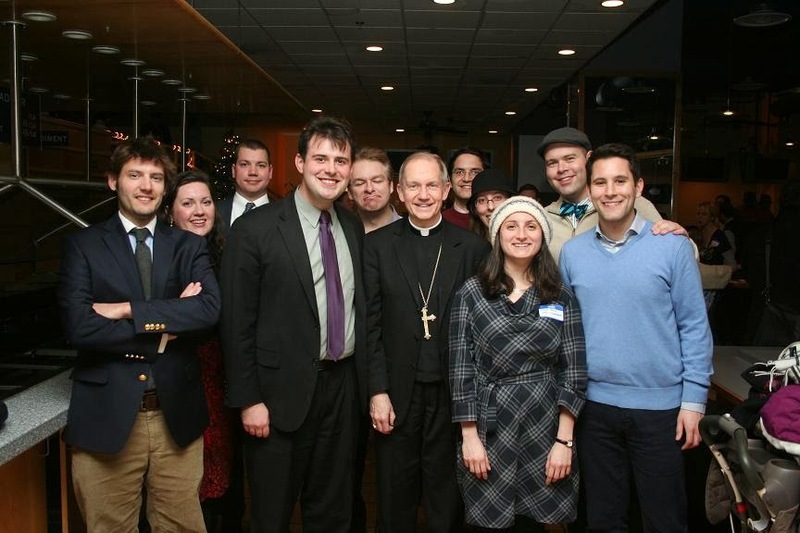 On January 5, 2014, Archbishop Salvatore Cordileone and Father Samuel Weber, OSB, the institute’s founder, officially revealed more specific details about the goals of the institute. In his introduction, Archbishop Cordileone announced the Benedict XVI Institute for Sacred Music and Divine Worship. The institute is fittingly named after the Pope whose book The Spirit of the Liturgy, written before his election to the Papacy, made a persuasive case for many liturgical practices that had fallen out of favor in the liturgical reforms that took place after the Second Vatican Council. Benedict XVI, of course, is the same Pope whose motu proprio Summorum Pontificum defended the Traditional Latin Mass as never having been abrogated, named it the “Extraordinary Form of the Roman Rite,” affirmed it was just as validly a part of the Roman Rite as the Ordinary Form, and gave permission for it to be celebrated more freely with fewer restrictions. This new liturgical institute is just one of several initiatives that Archbishop Cordileone has launched to put the principles of The Spirit of the Liturgy and Summorum Pontificum into practice. Fr. Weber training the faithful to sing Vespers. The cover of the chant booklet put together for the event. 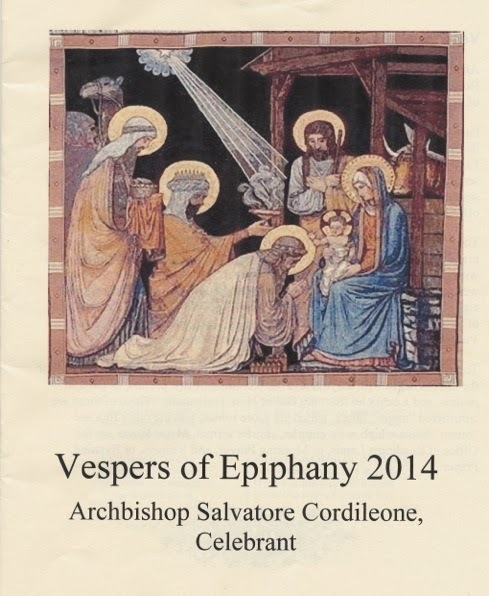 The hymn for Vespers of the Epiphany. Fr. 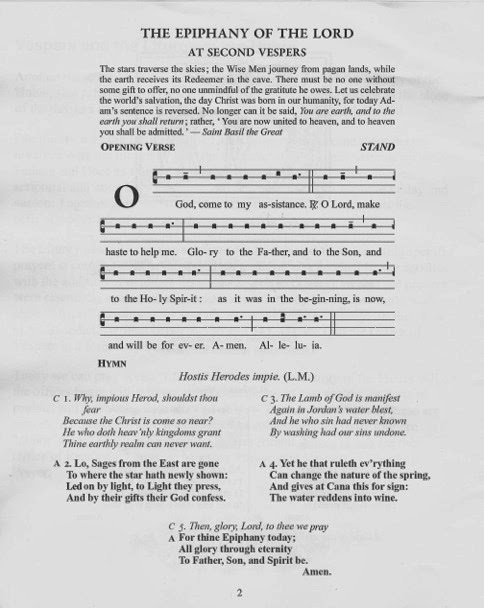 Weber leading the congregation in chant. A large part of the work of the institute will be to provide formation for lay people who are exercising ministries at parishes, and courses will be offered that will lead to certification in specific ministries. For example, Extraordinary Eucharistic ministers will be taught the theology of the Eucharist. Lectors will be taught Biblical theology, so that they will understand the context of the readings and what they mean in the history of salvation. 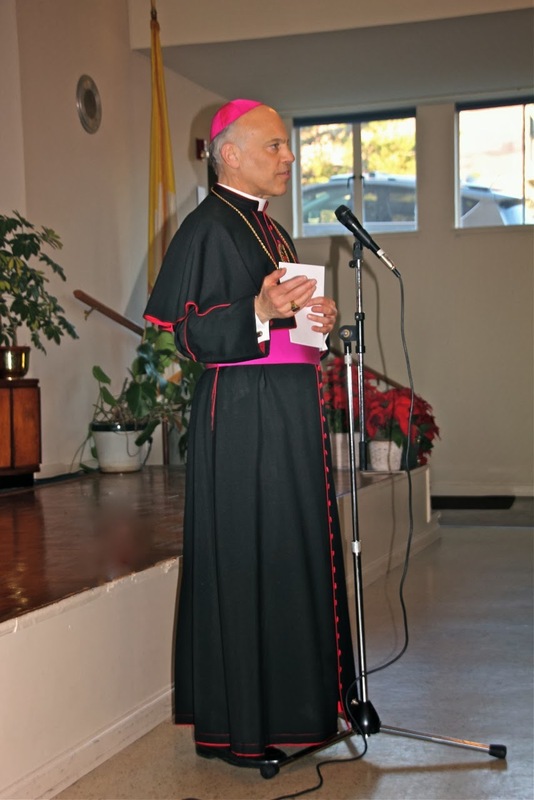 If we are going to enter into the true spirit of the liturgy, we need to inculcate a liturgical spirituality, a liturgical devotion – Archbishop Cordileone. The archbishop emphasized the importance of music in the new institute: “The heart of the institute is music.” The goal is to “reclaim the sacred music that is so much at the heart of our celebration of the Mass.” To do this, the institute will promote “what the Church has been asking us to do for a really long time, beginning at the Second Vatican Council” and continuing with “so many documents since, including the current General Instruction on the Roman Missal: Gregorian chant is to have first place in music at Mass.” Even when contemporary music is used, the parish musicians, as in any field, need to understand the tradition, so a course in "The Tradition of Sacred Music" will be required. For more information, see this article from Catholic San Francisco. For photos of the event, click here. For a videos of the event, click here and here. Initiated the creation of a Liturgical Institute at the seminary to improve the celebration of the Mass and church music, with the help of Fr. Weber, a world-renowned expert and composer of Gregorian chant, who previously founded and directed a trail-blazing Institute for Liturgical Music in St. Louis. See this article “New Liturgical Institute in San Francisco” for more details. 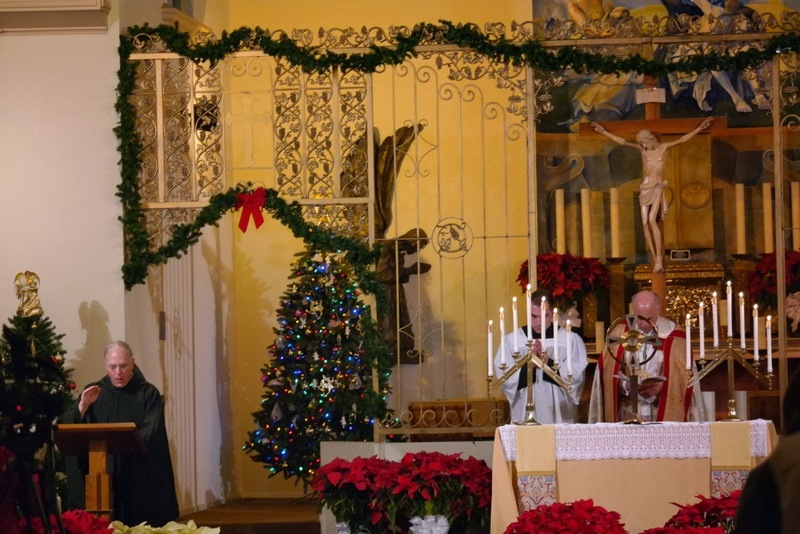 Established a weekly Extraordinary Form Mass at a San Francisco parish church during normal Sunday morning Mass hours (at 11:00 a.m.), weekdays at 7:30 a.m. and First Fridays at 6:30 p.m. When the pastor, Fr. Mark Mazza, asked Archbishop Cordileone who was going to celebrate the Masses, Cordileone told him that he was going to be the one. 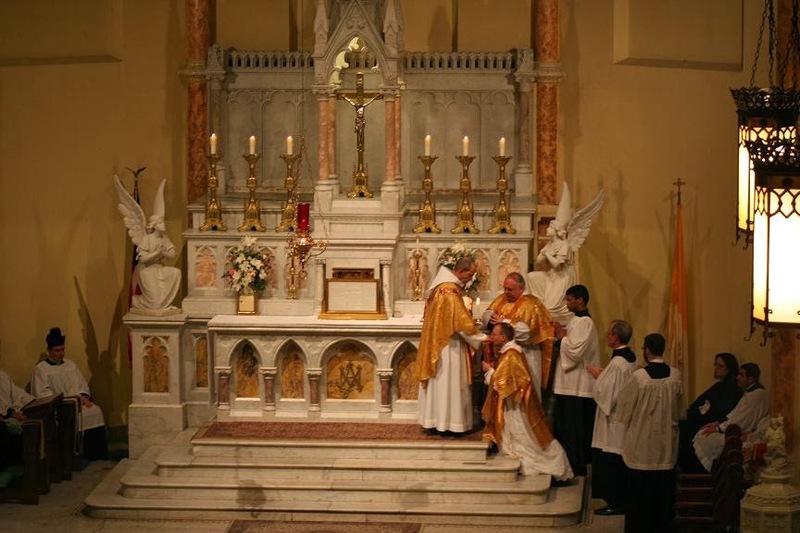 For the first time in about 50 years, what used to be the normal Latin Mass is being said regularly again in a centrally-located regular parish by a regular parish priest during regular Sunday Mass hours (before noon). See this article for more details. Commissioned the fledgling order of the Contemplatives of St. Joseph to dedicate themselves to liturgical reform in the archdiocese of San Francisco. Prof. William Mahrt, Church Music Association of America president, Editor of the journal Sacred Music, and director of St. Ann Choir has been teaching the two COSJ priests, and preparing booklets from them to use to chant the Divine Office. 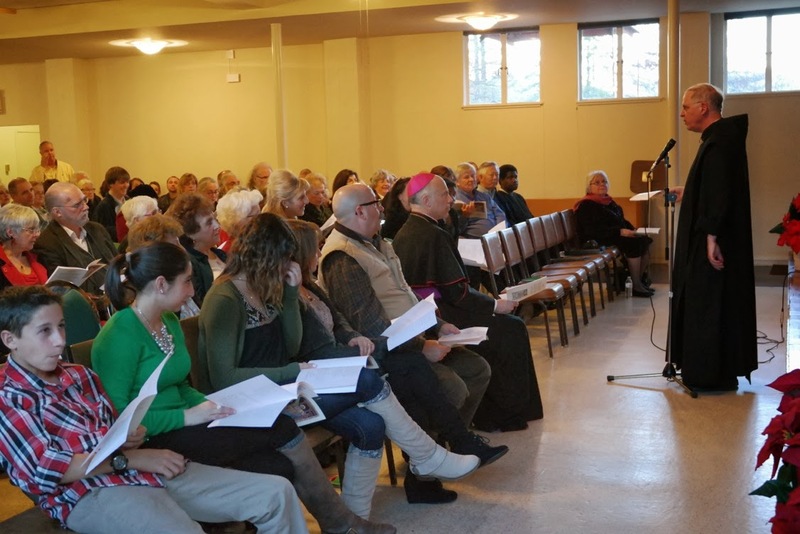 Canon Olivier Meney, a priest of the Institute of Christ the King, trained the priests in the Traditional Latin Mass, and they began offering a regular Sunday EF Mass at 5 p.m. in the city of South San Francisco on January 19, 2014, and daily Masses Monday to Friday at noon. They are also being called upon to teach others what they have learned. 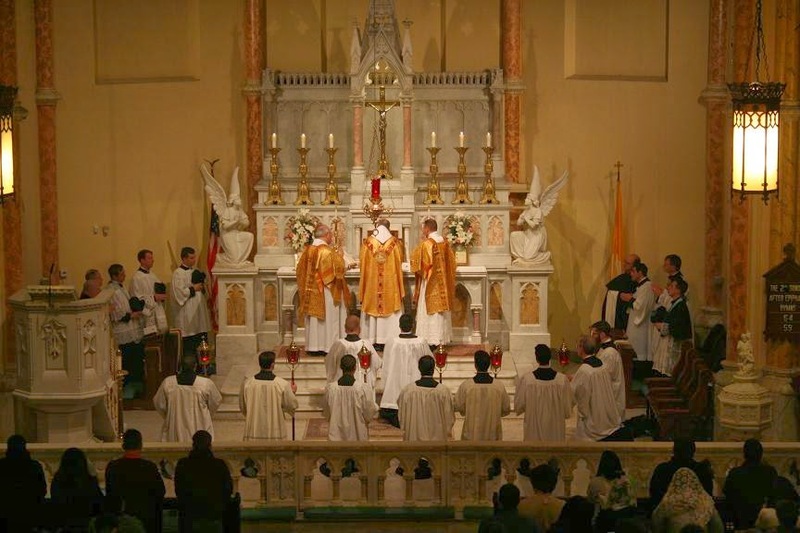 See this article, “New California Men’s Order Will Teach Roman Liturgy” for more details. I am the pastor of a huge parish of 35,000 in the Archdiocese of Guayaquil, Ecuador. 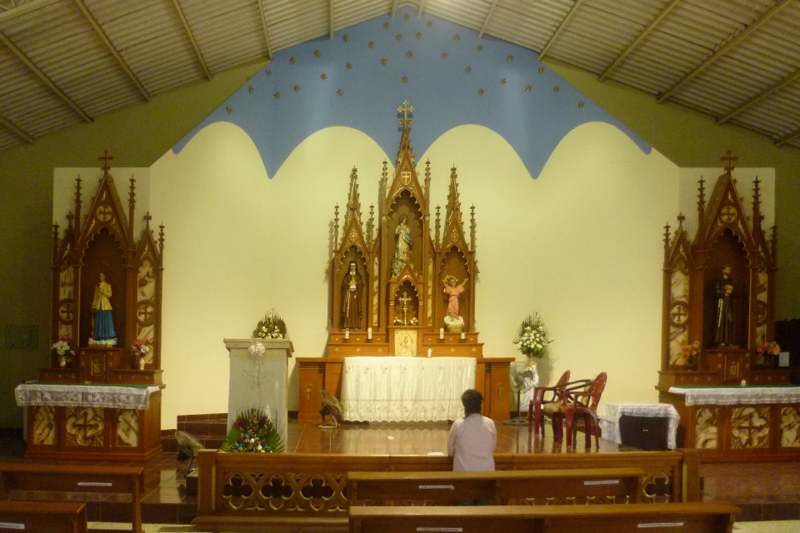 The parish has 2 TLMs per week and 8 Holy Masses in Spanish. 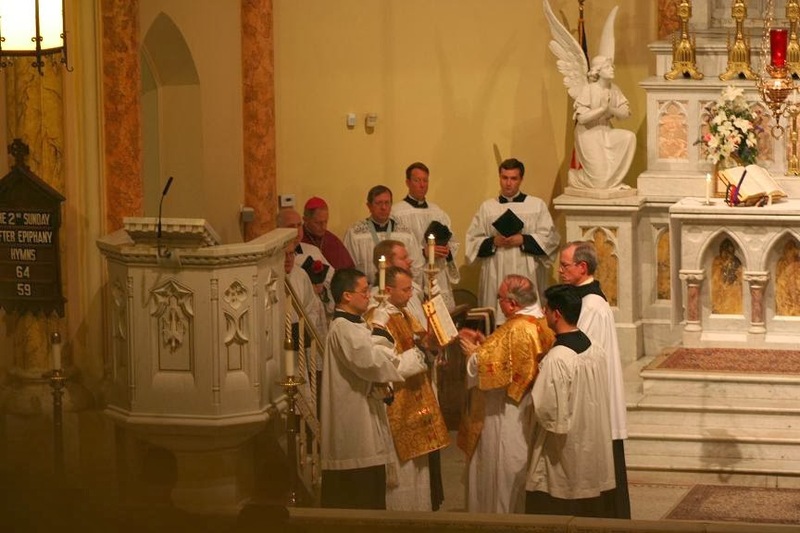 The altars are ad orientem. They are carved Gothic altars imported from Canada. They were restored by local carpenters. The communion rail with a gate was recently restored as well. We also have 3 huge bronze bells imported from Michigan. They were cast in 1934 and were taken out of a parish in Pennsylvania. The largest bell stands about 5'. They were blessed in the traditional rite and were named Santa Maria, San Francisco, and Santa Narcisa (patroness of Ecuador). The ropes were also blessed as the bells are rung manually during the consecration on Sundays. A reader sends news of the restoration work that has been underway for some years at St. Stanislaus Church in Milwaukee. 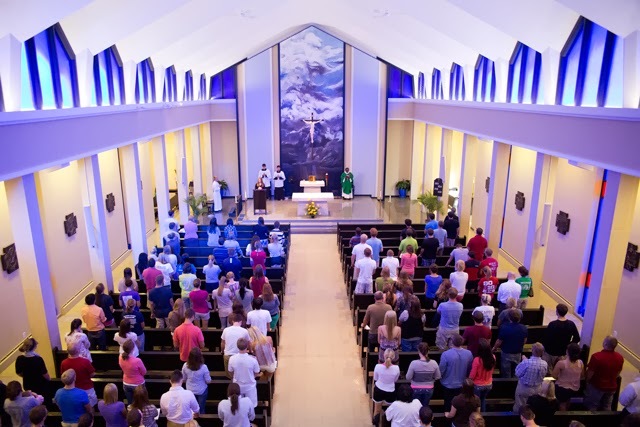 There the Institute of Christ the King and the revival of the traditional liturgy have brought new life to a parish founded by pioneering Polish Catholics in 1872. 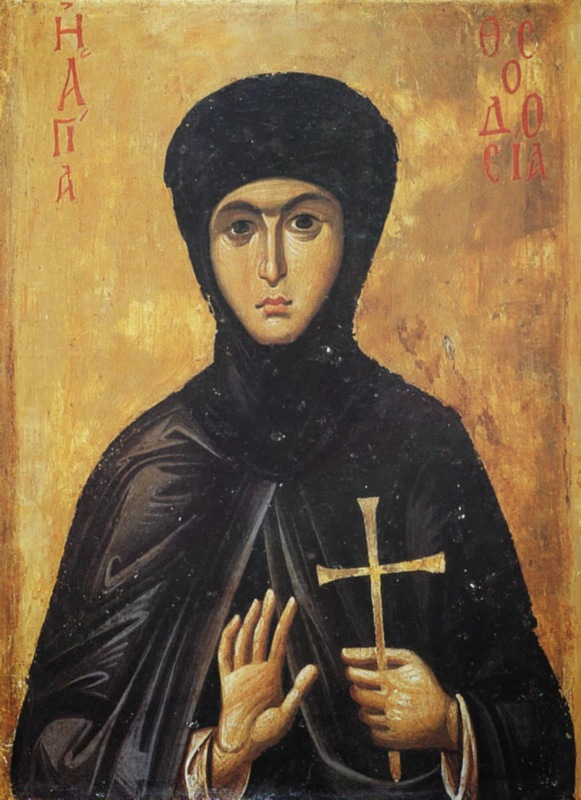 Creating a New Icon of An Old Saint - How Can We Do This and Stay in the Tradition? Is there such a thing as a new traditional image? How can you create something new without stepping outside tradition? Or is this something that we should not even attempt - a contradiction in terms? Those who have ever attended an icon painting class will know that the method of teaching is to copy an existing icon and that deviation from the prototype is usually flatly forbidden. This is an important and useful part of the training - provided that the student is given an understanding of what it is he is copying and why the artist who painted the prototype made the decision regarding style and content that he did. This experience can lead some to conclude erroneously that there is no room for any creativity or originality in icons. In fact while originality from the artist is never sought as an end in itself, sometimes it is necessary - when for example there is no existing image of a particular saint. 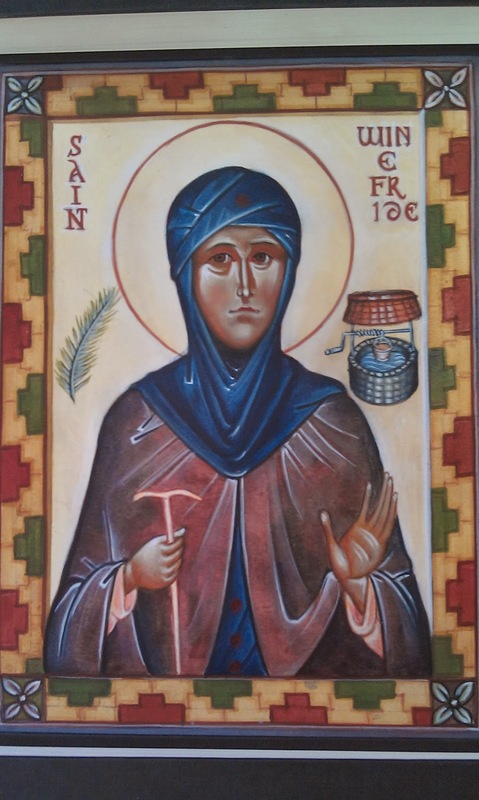 The icon top left is St Winifred (also spelt Winefride), a Welsh saint from the 6th century. This was painted by Aidan Hart the English icon painter. 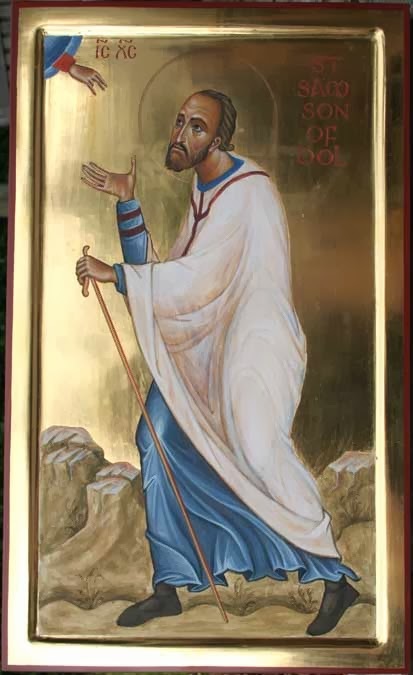 I haven't spoken to him about this, but I am not aware of any other icon of St Windfride and so I conclude that he has created this. Aidan has created a number of these icons of ancient British saints and I have heard him describe the general methods he uses. He researches the saints so that he can work out what visual features characterise the saint. Then, he looks at his library of existing icons and as far as possible makes a composite picture from these to create the new figure in the right posture. Only if he cannot do this does he introduce something completely new. 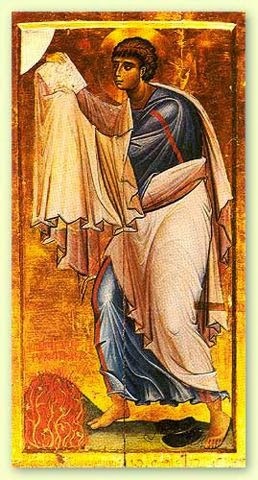 It struck me that the inspiration for St Winefride might be this icon of St Theodosia (see below) which comes from Mt Sinai and was painted in the 13th century; just as his Samson of Dol seems to be drawn from an icon of Moses receiving the 10 commandments of the same period (again both are shown below) . I do know for certain that these are the inspiration, but I do know that he has based his style on this golden age of icon painting that this belongs to and so it is possible. It is a Greek style in which has a relatively high level of naturalism (for icons) and so modern Western people tend to relate to it easily. In regard to St Windefride, it almost looks as though Aidan might have copied it from a mirror! 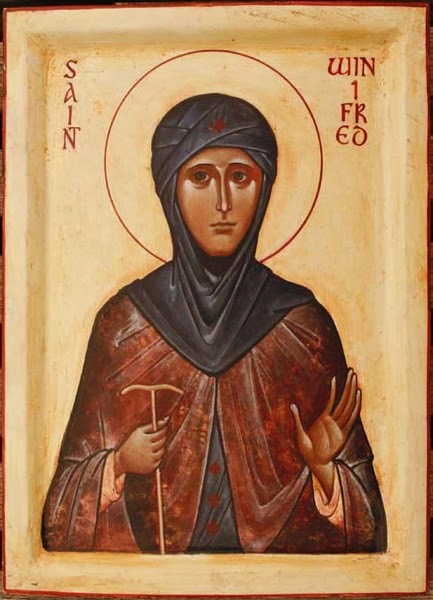 He has not done a straight copy though, he makes sure that it could be the saint he wishes to depict and so St Winefride is wearing the habit of a religious and has the staff of authority of an abbess. If I were faced with the problem of creating something new, I would have done precisely what I am speculating Aidan might have done. Recently I decided that I would like to paint an image of St Winefride too. I grew up near the pilgrimage site in Wales and for personal reasons had prayed to St Winefride. I promised her that I would paint a icon of her and donate it to the community of nuns who run the residential retreat centre at the tow of Holywell in North Wales where it is situated. So the first thing I did was look around to see what already existed and then found Aidan's. Very happily I took from that directly, but I added to the image the palm branch of a martyr and the well to depict the source of the healing waters which still flow today. I have also added the Romanesque/gothic style border, which characterises the Western sacred tradition of the Roman Rite and which I always like to include in my work. As always, I think Aidan does a better job, but I am happy nevertheless that this image will help the prayers of future pilgrims to Holywell. Images below, from top: St Winefride painted by Aidan Hart, St Theodosia, and my St Windefride; then Samson of Dol painted by Aidan Hart and then the 12th century Moses from Mt Sinai. It’s no secret that preaching in the Catholic Church today is of a generally abysmal quality. There are shining exceptions, no doubt, and if you are fortunate to be part of a community with one or several competent preachers, count your blessings. What we need, evidently, is for the internal memo to make the rounds: Priests and deacons everywhere, work hard on your preaching! It seems to me, on the basis of conversations with many priests, listening to a lot of preaching in my lifetime, and studying classic homilies as a theologian, that there are a few key principles to success. I offer a summary of these principles in a spirit of genuine appreciation for the demanding work of preachers everywhere and with a hope that something in these reflections may be found helpful. 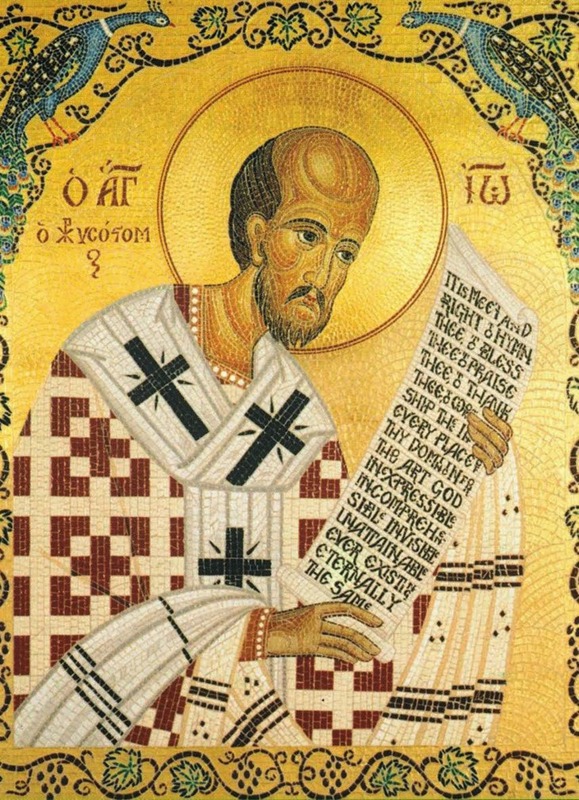 St. Paul tells us: “All scripture is inspired by God and profitable for teaching, for reproof, for correction, and for training in righteousness, that the man of God may be complete, equipped for every good work” (2 Tim 3:16-17). Why don’t we get genuine teaching? And reproof and correction? As for training in righteousness, when’s the last time you heard a strong call to holiness, righteousness, integrity of faith and purity of conscience? And yet that is the persistent message of Scripture to us. Wouldn’t it be galvanizing to hear, during the Christmas season, a homily preached on these two verses: “Your all-powerful word leaped from heaven, from the royal throne, into the midst of the land that was doomed, a stern warrior carrying the sharp sword of your authentic command, and stood and filled all things with death, and touched heaven while standing on the earth” (Wis 18:15-16). The Church has always applied this text to the coming of Jesus—and yet there is such a paradox: the helpless child lying in a manger...a stern warrior? How does he fills things with death—didn’t he come to bring life? Right away, one begins to see all the wonderful things that could flow out of this theme. The virtual abandonment of seriously Scripture-based preaching is the single greatest defect in Catholic homiletics today. Look at any Father or Doctor of the Church, or the greatest teaching popes, and you will see that their homilies are literally woven out of strands of Scripture. St. Augustine and St. Bernard of Clairvaux furnish some of the best examples of this. Which leads into a second key principle. In order to understand the Word of God they are to expound, preachers should be leaning heavily on the greatest theological sources after Scripture: the Fathers of the Church, St. Thomas Aquinas (e.g., the Catena aurea on the four Gospels [online or book form], or the Commentaries on Matthew and John, the Commentaries on the Letters of Paul—what a treasure-trove! ), and the writings of the mystics, like the Carmelite doctors. I was so delighted when I saw, some time ago, an American bishop take Blessed Columba Marmion, a sublime spiritual writer, as a basis for his Lenten preaching. That’s what we need to see: rich fare for the minds and hearts of the People of God. As Catholics, we believe that Divine Providence has raised up for us twenty centuries of holy men and women who illuminate for us the wisdom of Scripture. We do not try to do it all on our own—and when we do, the results are usually bad. Look at the preacher who speaks “off the cuff” about the day’s Gospel. Such homilies, as we all know, are some of the worst, very often straying into confusion, randomness, and false doctrine, all for lack of suitable guidance. It is an act of humility and a spiritual work of mercy towards the faithful to seek such guidance and to rely upon it. In Book IV of On Christian Doctrine, St. Augustine even says: If you don’t know how to preach, start by adapting stuff from the Fathers. Don’t be worried about “copying”; you could hardly do better than to copy them! Clergy and religious are bound to the Liturgy of the Hours, part of which is the daily Office of Readings. Why, then, do we so rarely hear the Office of Readings enter into preaching? Are the clergy actually reading it? So often there are perfect passages that illuminate the readings from the lectionary, and you would think that universally we would be hearing constant use being made of this Office. But it struck me recently, when our chaplain made several references to the Office of Readings, that he’s the first one I’ve ever noticed who’s done that. Is this Office some great secret that only the clergy are supposed to know about, that they are not allowed to share with the faithful for some reason? Clergy out there: Can someone enlighten me as to why this is not a much more common influence on preaching than it appears to be? Above I spoke of finding and leaning on reliable authorities. But who is reliable? And can we ever be certain of the truth of what we are preaching? For Catholics, there is always a third key principle: the Magisterium of the Church. Preachers should be taking in a steady diet of magisterial wisdom, for instance the Catechism and papal encyclicals, and making use of them. 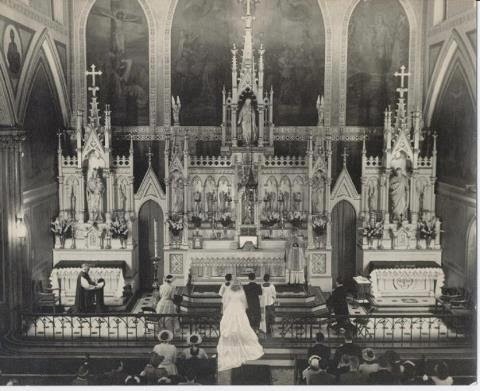 If a priest needs to preach on married love, where better to look than Pius XI’s Casti Connubii? If on the duties of Christian citizens towards their country and its government, Leo XIII’s Sapientiae Christianae? If on the nature of the sacred liturgy and the holy sacrifice of the Mass, Pius XII’s Mediator Dei? The list could go on. With such a wealth of profound and eloquent teaching given to us by the Church, it seems incongruous that it is so rarely shared with the people. Pope Benedict XVI comes to mind once again. His papal preaching is exemplary in every respect: in its lucid doctrinal content, in its eloquent and concise style, in its reliance on the best sources, in its pulsing spiritual vitality and conviction. If we are looking for a model to learn our preaching from, we will not find a better one. The three principles of this article can be summed up in a formula that will be familiar to students of the Second Vatican Council’s Constitution on Divine Revelation, Dei Verbum: (I) Scripture, (II) Tradition, and (III) Magisterium. It is hardly surprising, then, that the Joseph Ratzinger who assisted in the drafting of Dei Verbum during the Council should have given us, as Pope Benedict, a touchstone of what one might call “Dei Verbum preaching”—preaching of the Word of God, permeated with Sacred Scripture, richly endowed with Tradition, and informed throughout by the Magisterium. That’s a mighty and momentous charge; it is a charge given to every bishop, priest, and deacon. It is time that the clergy renew their dedication to preparing and delivering homilies that meet the desperate needs of the Church of our time, and so, become the evangelizers God has called them to be. The indefatigable Jeffrey Ostrowski of Corpus Christi Watershed (does he ever sleep?) 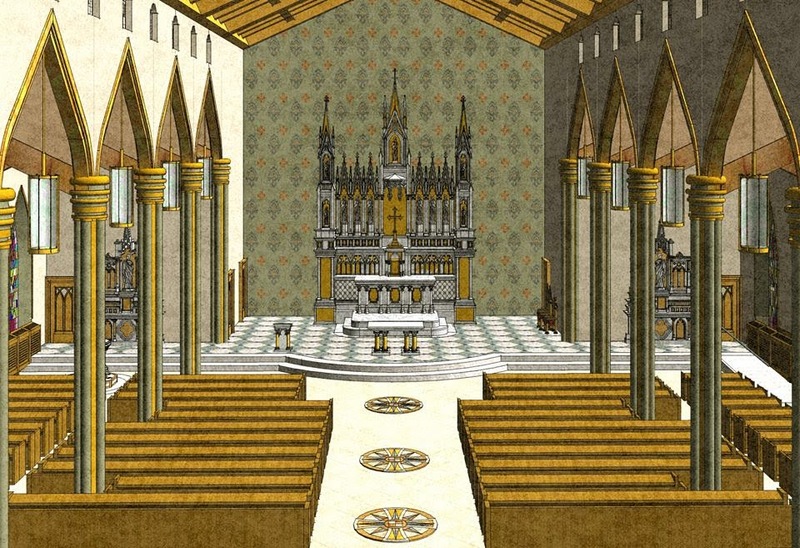 has posted over at Views from the Choir Loft the famous 2-volume study by Fr. Josef Jungmann, S.J., Missarum Sollemnia (published in English as The Mass of the Roman Rite: Its Origins and Development) for free download. Check it out -- it's well worth adding to your collection. Four bells for the St. Thomas Aquinas Church and Newman Center bell tower will be cast on Monday, January 27 at 1pm Central by the Verdin Company in Cincinnati, Ohio. You can watch the process LIVE through a webcast here, http://www.verdin.com/special/bell-casting01-2014.php . 1. Submission of name(s) for the four bells. 2. Why the Newman Center should select these names (please limit your response to 200 words or less). Etching will begin soon; the deadline to submit names is Monday, January 27th at Noon Central Time. is that eery glow from the transporter beam...? [...] a canonical association dedicated to the advancement of the Latin heritage of the Catholic Church, as it is reflected in the Church’s liturgy, in its sacred music, in its devotional life, in its official documents, and in its propagation of the Faith. This heritage is of the greatest value, as Pope John XXIII affirmed in his Apostolic Constitution, Veterum Sapientia. It is a continual sign of the Church’s establishment by God on the rock of Peter in Rome. It has helped to give the Church a splendid ability to attract, unite, and sanctify the faithful of every nation and culture of the world. It is essential for the preservation of this heritage that the Latin language itself, which is the bearer of that heritage, be USED. Pope Paul VI stated that those who are willing to devote themselves to learning, using and advancing Latin as a living language, do a great service to the Church. The members of the Family of Saint Jerome must also promise loyalty to the Holy Father, and must commit themselves to strive for holiness by following the example of the Saints. Members of Juventutem Miami are embarking on their second semester of work with one of the group's founders, Andrew Meszaros. In our bi-monthly meetings we'll be focusing this semester on the terminology and grammar of the Divine Office so as better to be able to pray the office in Latin. The Family of St. Jerome holds a yearly cenacle which immerses participants in Latin and prayer for a whole week. All conversation, lectures, activities, liturgies, and recreation are in Latin. Here's a video about the cenacle from an EWTN interview with one of the FSH's leaders, Jan Halisky. The complete interview with Mr. Halisky is available here. Their cenacle this year will be held at Visitation Monastery in Mobile, Alabama from July 31-August 5. The very reasonable price of $300, which includes meals, private room and bath, and all activities/instruction makes the week affordable to many, including families. The brochure with more information can be downloaded here. 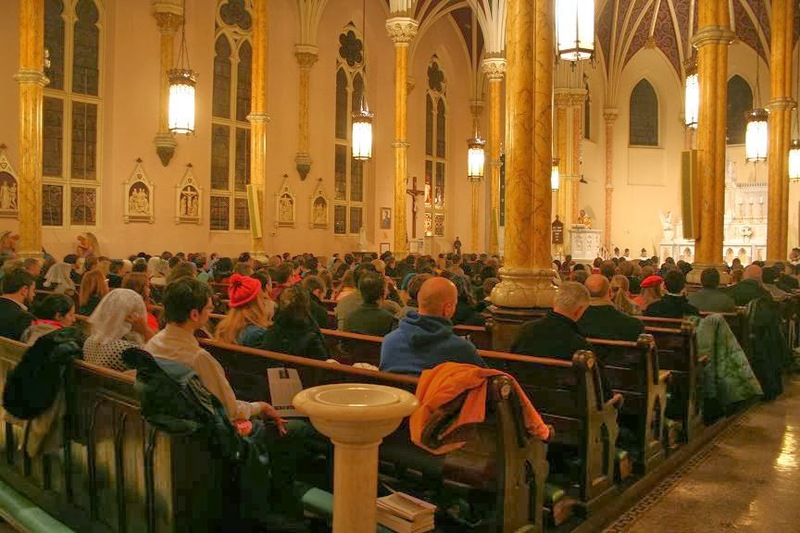 On Wednesday, January 22nd, following the 40th annual March for Life in Washington, DC, a Solemn High Mass in the Presence of a Greater Prelate was held at a filled-to-capacity Old St. Mary's in Chinatown for the repose of the soul of the March for Life foundress, Nellie Gray, who passed away in 2012. The Mass was organized by the Paulus Institute for the Propagation of Sacred Liturgy, and cosponsored by The Lyceum School of Classical Catholic Education (whose Schola Cantorum sang for the Mass), Juventutem Michigan, and Juventutem DC. Fr. Abbot Philip Anderson of Clear Creek Abbey, Oklahoma, was the celebrant for the Mass, Msgr. Andrew Wadsworth (of the Oratorians in Formation in the Community of St. Phillip Neri, Washington, DC) assisted as deacon, and Fr. Gregory Pendergraft, FSSP as subdeacon. Bp. Thomas Paprocki (Springfield, Illinois) assisted in choir, as did other clerics. A social, sponsored by Juventutem Michigan and Juventutem DC, was held following the Mass and attended by more than 200 young people. 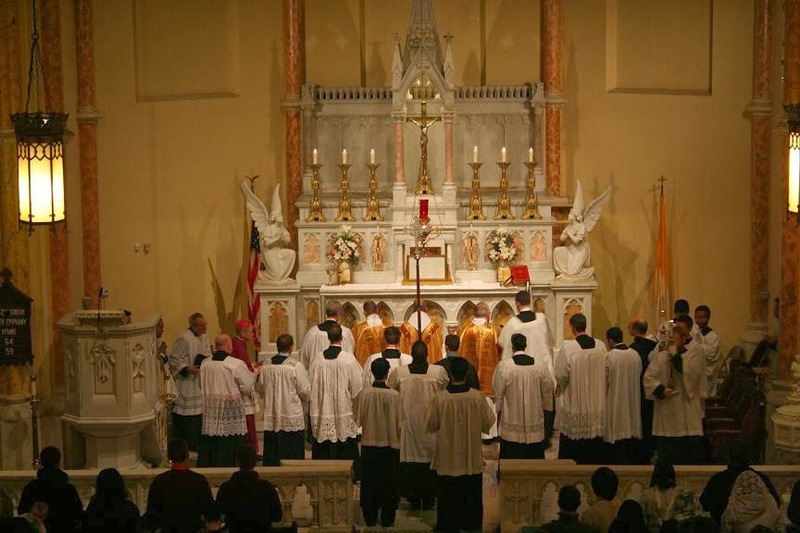 The following pictures of the Mass are courtesy of Juventutem Michigan; other photos of the Solemn High Mass, Holy Hour from the evening of January 21st, early morning low Mass before the March, and Juventutem social following the Solemn High Mass can be found here. Come learn how to read and sing a common repertoire of Gregorian chant following the Solesmes style. We will explain different types of notation and sung parts of the Mass (Ordinaries and Propers). The initial goal will be to learn a few hymns sung during Benediction (e.g., O Salutaris, Ave verum corpus, and Tantum ergo). Participants are invited to sing at Exposition and Benediction immediately after at 12 Noon. You can attend part or all of the workshop. Music will be provided. No singing experience required. 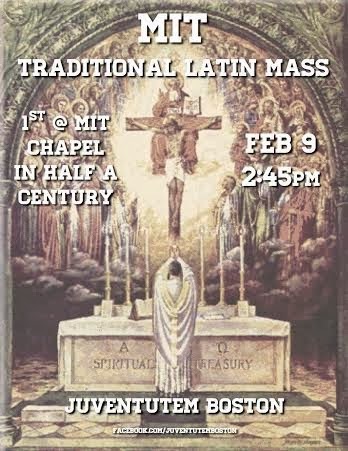 Come simply if you want to learn about our beautiful music tradition which, following the Vatican II document Sacrosanctum Concillium, continues to be given pride of place in the Roman liturgy. All are welcome. Pre-registration is helpful for planning and logistics, but not required. Brian Bartoldus is doctoral candidate at the Yale Institute of Sacred Music with a concentration in Choral Conducting. Fr James Bradley is a priest of the UK Ordinariate studying Canon Law at the Catholic University of America. We recently had occasion to mention the ensemble Suspicious Cheese Lords, and explain their peculiar name, à propos of a Mass celebrated in the E.F. at Our Lady of Grace in Greensboro, North Carolina on January 12th. Their specialty is rare and unrecorded music, including works by lesser known composers. To the Cheese Lords goes the honor of having made the first ever recording of Palestrina’s Mass O admirabile commercium; both they and the pastor of Our Lady of Grace, Fr. Eric Kowalski, are to be congratulated for bringing such a work out of the recording studio and into its proper home, the Church. On their website, the SCL have announced an initiative which I hope will meet with a great response, a contest for new compositions of sacred music. The terms of the contest are given below, (with my emphases for the most salient points,) and of course also listed on their website, under the button labelled “composition contest.” NLM is very glad to help the Cheese Lords promote this initiative, and we are very much looking forward to reporting on the results when the contest is over. I would strongly encourage other bloggers to spread the word about this, especially those who write about liturgy and music. Likewise, if any of our readers know musicians who might be interested, please pass this information to them. 1) This contest is limited to residents of the United States and Canada not older than 35 at the time of entry submission. 2) Only one work per composer will be accepted. 3) Entries are to be scored for a cappella men’s choir, including male altos (the comfortable range of our male altos extends to the D a major ninth above middle C). Composers are encouraged to not exceed more than six independent lines, whether solo or ensemble parts, for any significant length of time. Applicants may set texts from the book of Psalms or Proverbs. The choice of language and/or translation is left to the discretion of the applicant. Entries must be ten minutes or less in length. 4) Compositions must be received not later than 5:00 PM, Aug 1, 2014. 5) Entries may be submitted either electronically or through regular mail. Applicants who wish to submit electronically must e-mail a completed application form and a pdf file of their entry composition to composition@cheeselords.com. Applicants who wish to submit their application by mail must send a completed application and four (4) clearly reproduced copies of their entry compositions to: SCL Competition Contest, 1236 Euclid St NW, Washington, DC 20009. Non-readable copies or pdfs will be eliminated from the contest and the composer so notified. 6) Application materials will not be returned. Applicants who choose to mail their application are strongly urged to retain a copy of their entry for their own reference. 7) The composer’s name must not appear on their entry composition. A pseudonym shall be clearly printed on the manuscript and on the Application Form. Compositions are to remain anonymous to the judges. 8) Suspicious Cheese Lords claims the right for first performance of the entry submission; therefore, compositions must be works that have never before been performed in public, outside of a studio or classroom in an academic forum or workshop setting. Entries may have been previously submitted in other contests, providing that no part of the composition has been a prize-winning entry as of the date of submission. 9) Performance of the prize-winning piece is offered during the 2014-2015 season; however, Suspicious Cheese Lords reserves the right to award the prize without performance, as well as the right to perform more than one prizewinning entry. It also reserves the right to make no award, if, in the opinion of the judges, the compositions submitted to not meet standards of excellence. 10) This competition is not open to current or former members of the Suspicious Cheese Lords, or their immediate relations. Here is some footage of a Pontifical High Mass at Westminster Cathedral in 1950 on the occasion of the 100th anniversary celebrations of the Restoration of the Hierarchy. Cardinal Griffin was the celebrant and the Cathedral Choir was directed by George Malcolm. Some details are available here. The second clip is longer and also contains some interesting footage however the sound is of very poor quality and is not in sync with the image. Three final factors which in my view point towards the propriety of a generous approach to the SSPX, and a gracious receptivity on the part of the Society, and towards a cessation of any tendency to persecute institutes or individuals in the Catholic Church for a crime of Cryptolefebvrianism. Many wonder what good the Ecumenical Movement has done. It hasn't even had the result of preventing ecclesial bodies from introducing new divisive measures, such as women's ordination. But this very ineffectiveness surely points to the one great big message we could and should all learn from the Ecumenical Movement: that the longer a division lasts, the more deep-rooted becomes the habit of separation and, in practical and human terms, the more unlikely it becomes that a reconciliation can ever happen. Secondly: Summorum pontificum confirmed juridically that the Latin Church had lived for some four decades under the dominion of a lie. The Vetus Ordo had not been lawfully prohibited. Much persecution of devout priests and layfolk that took place during those decades is therefore now seen to have been vis sine lege [force without law]. 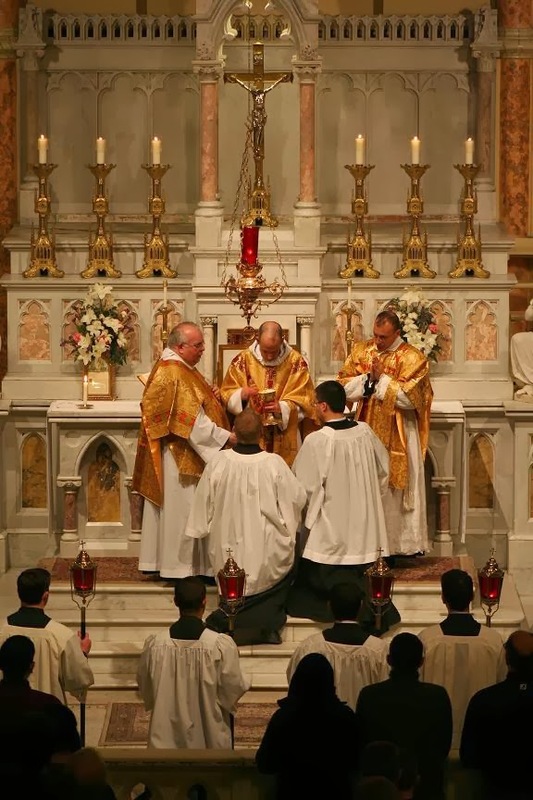 For this so long to have been so true with regard to the Holy Sacrifice of the Mass, which lies at the heart of the Church's life, argues a profound illness deep within the Latin Church. And the Big Lie was reinforced by multitudes of Little Lies ... that the Council mandated reordered Sanctuaries ... that the Council mandated exclusive use of the vernacular ... The de facto situation created by the Big Lie and the Little Lies combined ought not to be regarded as normative. Its questionable parentage must give it a degree of provisionality, even (perhaps especially) to those who find it comfortable to live with. The onslaught upon the Franciscans of the Immaculate suggests that there are those, high in the Church's administration, who have still internalised neither the juridical findings of Summorum pontificum nor its pastoral call for harmony. Thirdly: Conciliar hermeneutics have moved on. I do not only refer to the teaching of Benedict XVI about 'Continuity' and 'Rupture' (although I think this is important and I was disappointed that spokesmen of the SSPX were more concerned to evade this discussion than to grab it and run with it). I mean also the much greater willingness among many to take a longer view of the Council. The more distant an object is down the lines of perspective, the smaller it appears to the eye (do you even know when the Council of Vienne was?). Benedict XVI echoed Newman's celebrated remarks about what unpleasant events councils have generally been and how harmful; and theologians are much less nervous now about admitting the existence even of textual problems within Vatican II itself. Arguably, Councils are best kept up the sleeve of the Sovereign Pontiff. Our present Holy Father had not been long on the Throne of S Peter when he commented on the facile optimism of Vatican II and opined that we are not so naive today (does this make him a Cryptolefebvrian?). At the heart of this question is a really very obvious and simple truth: the Council earnestly and laudably desired to engage with the mundus hodiernus, the mundus huius temporis, and with nostra aetas; but we are not now still in the mundus or aetas of the 1960s. The Council of Vienne, like Vatican II a largely practical Council, happened 700 years ago, but it took much less time than that for it to recede so far as to disappear off the Church's horizons; and it is a long time since anybody was required to eat humble pie with regard to its Conciliar documents, the "Spirit of Vienne", and "the entire post-Viennian Magisterium". Time itself possesses a quasi-Magisterial status, and I think enough time has elapsed since Vatican II to enable us to ... No: I will most certainly not say 'to renounce it'. After all, when Philip IV collected money for a crusade within six years and then simply embezzled that money together with the wealth he had looted from the Templars, I do not know that the Holy See thought it appropriate to annul the proceedings of Vienne. No; it is time simply to move on from the 1960s to the mundus hodiernus and the nostra aetas of 2014. When an elderly ball has been kicked around for long enough, sensible schoolboys leave it to settle quietly into the nutrients at the bottom of the ditch, unobserved except by the water voles, and agree to move on together to newer games. Whatever was of permanent value in Vienne ... and Vatican II ... has merged and disappeared gradually into what one might call the Church's general background noise (dogmatic decrees and anathemas of dogmatic councils are, of course, a different matter). What was unhelpful in the Conciliar texts or their consequences ... and when the Templars were led out to be burned, they probably thought that was unhelpful ... Time has purged away; or will purge. The entire post may be found here. 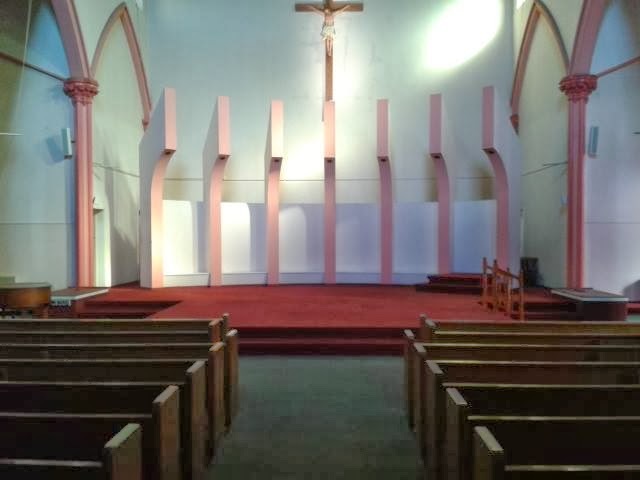 The Church of the Holy Name of Jesus in the Windsor Terrace neighborhood of Brooklyn, New York, has begun the process of undoing the comically awful wreckovation to which it was subjected in 1980. 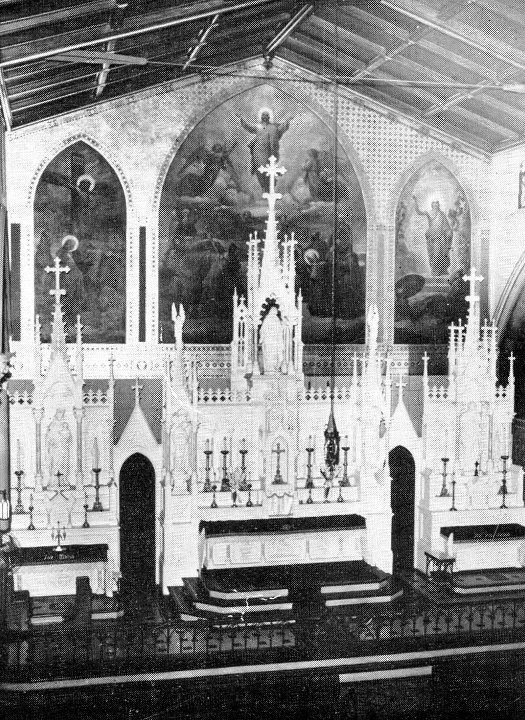 Built and consecrated in 1878, the church’s original sanctuary looked like this. (Photographs from the parish's facebook page.) The first shows the original altar during a wedding, the second gives a better idea of the paintings on the back wall behind it. It was changed to look like this. No one will be surprised to hear that the comments on the facebook page linked above are overwhelming positive in favor of the proposed restoration. The administrator of Holy Name, Fr. Jim Cunningham, notes in the video below that the new arrangement of seven large… things sticking out of the floor reminded a lot of people of the transporter room on the USS Enterprise. (They were supposed, somehow, to represent the Seven Sacraments.) Towards the end of the video, he bravely demonstrates for the viewer the shabbiness of modern building materials. Fr. Cunningham explains here that the Diocese of Brooklyn has donated to Holy Name an altar designed by the famous architect James Renwick, Jr. 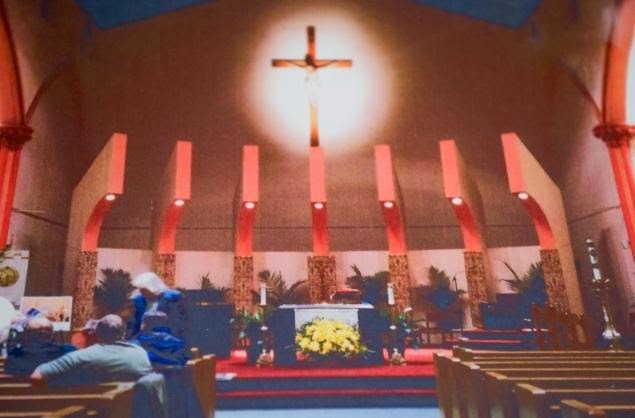 It was originally intended for St. Patrick’s Cathedral, but proved to be too large, and was therefore installed in St. Vincent de Paul, a recently closed parish in the Williamsburg neighborhood. 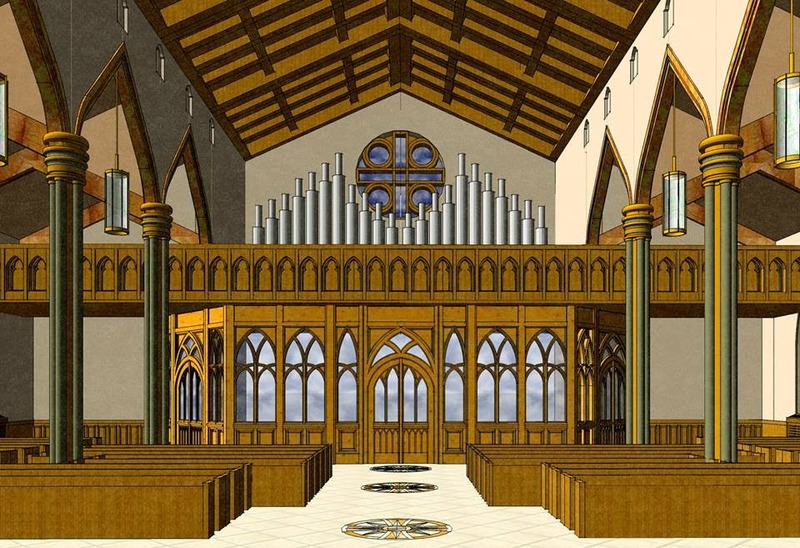 Here is the proposal for the completed restoration of the sanctuary, which is being done by Connecticut-based Baker Liturgical Art. And here is the proposal for the back of the church and the organ loft. 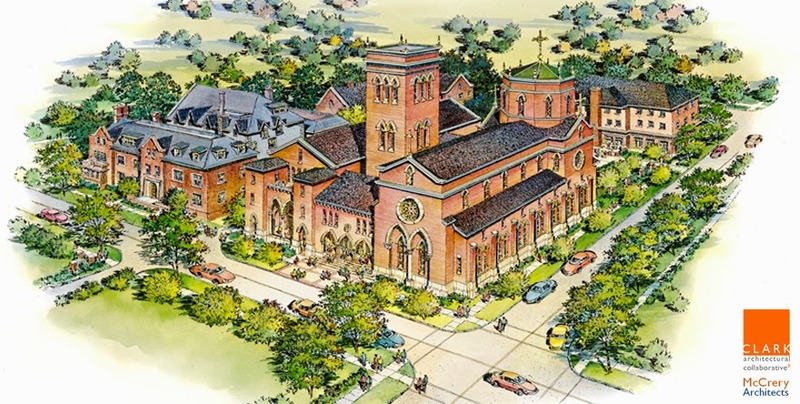 The parish’s website has extensive documentation of the project, which will also see the renovation of several other parts of the church, including the baptismal font and the stained-glass windows. It has also been covered by the N.Y. Daily News. Congratulations to Fr. Cunningham, to all of the parish staff, and to His Excellency Nicholas DiMarzio, Bishop of Brooklyn, for undertaking this beautiful and much-needed restoration. 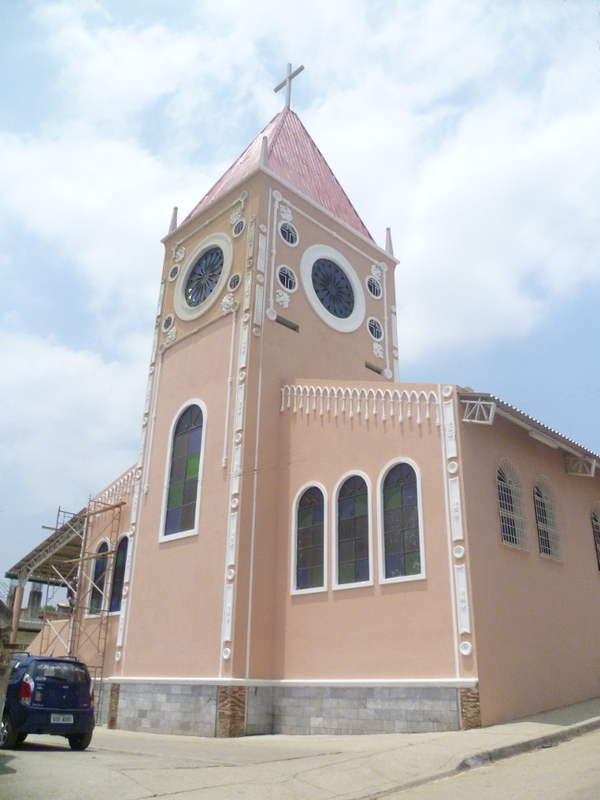 And likewise, kudos to the faithful who have superabundantly provided the funds needed to restore their church!